Free year subscription Camperstop-App when you buy the motorhome guide Camperstop Europe 2019! The Camperstop-App contains all motorhome stopovers from this motorhome guide, over 10,750 spread througout the 27 European countries. After purchasing the 2019-edition of the motorhome guide ‘Camperstop Europe 2019’, you can use all functionalities and the complete database of the Camperstop-App for free for one year. The Camperstop-App (Android and iOs) is suitable for both smartphone and tablet. Activate your free yearsubscription in 4 simple steps and get the Camperstop-App for free for a year. Create an account below and activate the promotional code. Activating your account is only possible when entering a valid promotional code. A must-have for every motorhomer! The Camperstop-App contains more than 10,750 inspected motorhome stopovers throughout Europe! A must-have for every European motorhomer. 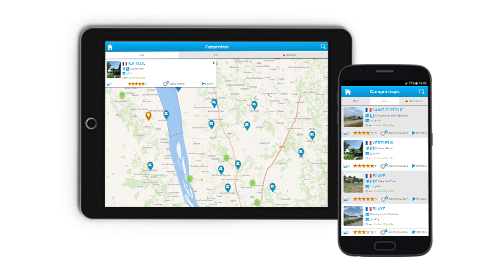 The Camperstop-App allows you to find motorhome stopovers easily and contains up-to-date, detailed information, images and reviews from other motorhomers. Due to the detailed information and the reviews of others you know within no-time if the stop meets your requirements to stay overnight. Download the Camperstop-App for your smartphone and/or tablet!